Clubhouse director Marcus Twine and Caleena Blackburne react to a good shot at the Jim & Vicki Click gymnasium at the Boys and Girls Club at 1935 S. Columbus Blvd. Michael Wright, left, connected with his Big Brother Elliot Breshears about eight years ago. They’re still going strong. For about eight years Michael Wright has called Elliot Breshears his Big Brother. 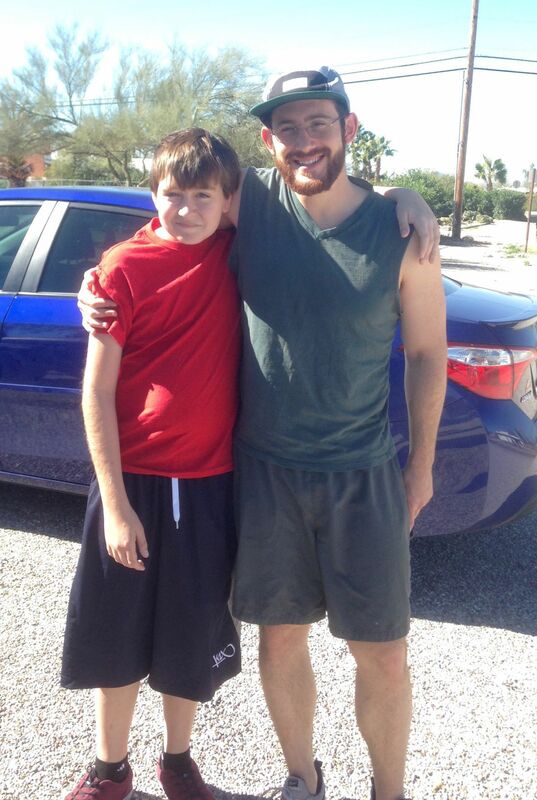 The two met after Breshears, a University of Arizona undergraduate at the time, heard that Big Brothers Big Sisters of Tucson needed male mentors. Michael, now a 17-year-old senior at The Rising School, was around 9 years old. Over Frisbee tosses and water-park trips, they mastered this Big Brother/Little Brother thing. But many kids aren’t so lucky. Big Brothers Big Sisters of Tucson has a waiting list of about 140 children and youth. Twenty girls are waiting for matches. The rest are boys, said Marie Logan, the organization’s CEO. The public call for male mentors — especially men of color — that Breshears answered still resounds. On Monday, Aug. 21, Tucson Mayor Jonathan Rothschild will announce an initiative encouraging more Tucsonans to partner with agencies making a difference in the lives of our young people. “If we can keep young people in school, and if we can get young people to involve themselves in extracurricular activities, and if we can move young people toward graduating high school and then on to postsecondary activity, whatever that may be, that makes for a stronger community,” Rothschild said. He sees this mentoring push as complementary to other initiatives, such as fundraising for Literacy Connects’ Reading Seed and its recruitment of in-school reading coaches, and Steps to Success, a partnership with Tucson Unified School District to knock on doors of recent high school dropouts and encourage them to reconsider graduation. The mayor’s office has found that many mentoring organizations in our city don’t have enough men of color stepping up for young boys. So while this is a call to the entire community, Rothschild is especially asking this specific demographic to volunteer. Getting involved is easy. The mayor’s office has compiled a list of about 10 organizations that already match Tucson’s youth with mentors. At mayorrothschild.com/mentor you can peruse that list and find a fit for you. Fill out the form and you’ll receive additional information about organizations of interest. Because mentoring involves the community in the future of its youth, it has the potential to reduce high school dropouts and the number of young people who are not working or attending school, identified as “disconnected youth” in a 2014 report by the Arizona Mayors Education Roundtable, a initiative of the nonprofit research agency WestEd. Based on 2012 data from graduating classes in 10 Arizona cities and from the state as a whole, the report estimated Tucson’s dropout rate at 22 percent and its disconnected youth rate at 21 percent, about the same as Arizona numbers of 20 percent and 22 percent, respectively. Oro Valley had a dropout rate of 13 percent and a disconnected youth rate of 17 percent, and Sahuarita had a dropout rate of 23 percent and a disconnected youth rate of 20 percent. A new draft relying on 2015 data suggests Tucson rates could be slightly lower. In Tucson, the estimated dropout rate causes roughly a $435 million lifetime economic loss, and the disconnected youth rate causes an $8.5 billion lifetime economic loss, the report said. Adults who don’t finish high school also increase public and private spending on health, crime and welfare, the report found. That’s where mentors come in. Corvell Littleton, 18, started going to a Boys and Girls Clubs of Tucson clubhouse about five years ago to hang out with friends and play basketball. He said the connections he made with men at the Jim and Vicki Click Clubhouse kept him from continuing on a dangerous path after an arrest for fighting his junior year of high school. Playing basketball and shooting pool, clubhouse director Marcus Twine and youth program director David Lopez grew close to the teen. Having men he trusted who stuck with him gave Littleton a glimpse of a path he hadn’t yet imagined. Although he didn’t graduate on time, he plans to soon and dreams of attending college. He’s finishing school at the Fred G. Acosta Job Corps Center and is working toward becoming a certified nursing assistant. “He’s completely turned around. Now he is doing Job Corps and we talk every day — and that’s just one story,” Twine said. The UA’s College of Education has a program that places undergraduate students in under-resourced middle school classrooms. Called Project SOAR, the class aims to build relationships between middle school and college students. SOAR stands for Student Outreach for Access and Resiliency. “We’re there to provide support and guidance and put the possibility of education after high school ... into their minds,” said Mary Irwin, director of Project SOAR and assistant professor for the College of Education. Because Project SOAR works in about a dozen schools that often don’t have the time or staffing to promote college readiness, working with a mentor may be the primary way some students are able to visualize college — especially if they come from a background without a culture of postsecondary education, she said. And yet even the SOAR program sees a shortage of men — male students make up about 25 percent of the class. SOAR, and other mentoring programs, aim for more diversity in all areas among these role models. When researching how to best spur Tucson’s young people on toward college, work and a productive postgrad life, the mayor’s office decided mentoring, not scholarships, would “be more sustainable long term and have a bigger impact,” Rothschild said. While connecting students with scholarships could come later, for now the emphasis is on building life-changing relationships. The mayor’s office is also forming a leadership council to recruit mentors specifically from African-American and Hispanic communities. Rothschild hopes the faith community can play a role. “Whatever we can add by creating this enthusiasm, I think it’s going to change lives,” he said. He is also encouraging employers to recruit mentors and create spaces for young people to intern and encounter real-world mentors. Whatever the setting, the impact is powerful — and lasting. If you're interested in learning more about other organizations working with the mayor to increase mentoring in Tucson or want to be contacted about how you can get involved, visit mayorrothschild.com/mentor. Read the Star for the next three days to learn more about individual mentoring organizations. The information below appears as it does at mayorrothschild.com/mentor. All organizations require background checks and volunteer training. Visit the site for additional requirements. Thrive Mentor: Help a teen/young adult preparing to age out of foster care to become self-sufficient. Community Mentor: Become a Big Brother or Big Sister. “Bigs” and “Littles” spend two to three hours together two to three times a month having fun in and around Tucson. Mentor 2.0: Help high school students aspire to college, navigate the application process and gain the skills to succeed academically. Mentors follow up online with students who attend weekly classes in critical thinking, goal setting and self advocacy. Cubmaster, Den Leader or Scoutmaster: Be a troop leader or an assistant troop leader. STEM Nova Counselor, Venturing Advisor: Facilitate STEM activities, outdoor adventures and more for young men and women ages 14 to 21. Homework Help/One-on-One Tutoring: Help with homework after school at a Boys & Girls Club location. Youth Mentoring: Help youth ages 7 to 18 reach their full potential by mentoring them at one of six club locations around Tucson. CASA: Advocate for a child who has been removed from the home due to abandonment, abuse or neglect. CASA volunteers build relationships with their assigned child and advocate for everything that’s in the child’s best interest. Boys to Men Mentoring: Participate in mentoring group circles and adventure outings. Girl Scout Mentor: Guide girls through the Girl Scout Leadership Experience. Mentorship can be based on your skills, strengths and interests. Troop Leader or Co-Leader: Foster a girl-led, girl-focused leadership experience that empowers girls ages 5 to 17 in a safe and encouraging environment. GoodGuides Youth Mentoring: Empower at-risk youth, ages 12 to 17, through a mentoring relationship that supports positive decision making, school completion, postsecondary education and community connection. School-based mentoring: Support middle school youth through a school-based curriculum that facilitates positive decision making, self-empowerment and academic success. Help seventh- and eighth-grade students gain skills that will help them academically and in the workplace and share what’s involved in preparing for various career options available in Tucson. Mentor a homeless teen through Goodwill’s GoodGuides Youth Mentoring program. Be a mentor - Tucson kids need you.